A research effort to restore “threatened” steelhead to several rivers draining into Hood Canal is beginning to yield some interesting and important results. Sean Hildebrant of Hood Canal Salmon Enhancement Group shoots 2-year-old steelhead into the Dewatto River. One line of study points to the success of growing steelhead more slowly, so that they are ready to go out to sea in two years instead of just one, as in most steelhead hatcheries. Growing two-year-old smolts mimics natural conditions and seems to dramatically increase the chance of survival. Other work involved in the Hood Canal Steelhead Project is focused on counting fish coming and going, tracking their movements with implanted acoustic tags and examining any shifts in genetics. 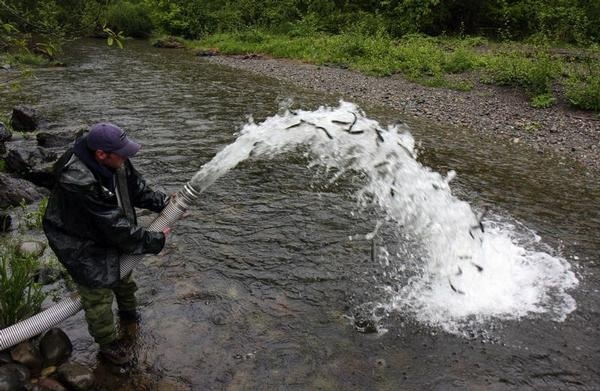 Last year, I wrote about the last of the propagated steelhead to be released into the Hamma Hamma River, where supplementation started a decade before. (See Kitsap Sun, March 16, 2008.) Thanks to this supplementation project, the number of steelhead returning to the Hamma Hamma have increased from an annual average of 17 to more than 100. Barry Berejikian tells me that he won’t be alarmed if the numbers of returning adults to the Hamma Hamma drops somewhat, now that supplementation has stopped. We won’t really know the carrying capacity of the river for a few years, but it’s important to understand that the productive part of the river is relatively short because of an upstream fish barrier. Available habitat is not so limited with other Hood Canal streams, such as the Dewatto, which is now gaining increasing attention. So why did the steelhead decline to such feeble numbers in the first place if the habitat has always been there? One theory is that fishing knocked the numbers of spawners down so low that the populations were just hanging on. If that’s true, then a supplementation program could be the trick to restoring healthy numbers to sustain the run. The Hamma Hamma could be the case that supports this idea. For additional information about the Hood Canal Steelhead Project, go to the Long Live the Kings Web site.